The Wolverine is a pretty fun movie. Okay, it’s straight out of the Big Book Of Japanese Tropes, right down to the ninjas and the chopsticks, but it’s certainly refreshing to see a superhero movie that takes place somewhere other than a thinly-disguised New York. But there is something slightly weird about the cast of characters. There’s a huge amount of redundancy in their character functions – that is, in the ‘types’ of character they are. There’s a rich ambitious grandfather – and his rich ambitious son. The granddaughter has a former boyfriend – and a current boyfriend (who’s also rich and ambitious and thus occupies a similar character function as her father). On top of this, the granddaughter has a female live-in companion of the same age, with similar skills, concerns and wants to her. Characters, characters everywhere, and many of them very similar! What’s going on? The answer seems to be in the combination of genres involved in the movie. Most of the movie is a detective thriller – there’s an evil plot afoot and we need to know who’s behind it – and only in the third act does it shift into a superhero-action movie. And for a detective story, you need a wide cast of characters to provide suspects and red herrings. The problem is, what do you do with them when you shift into an action movie and you need a few clearly defined characters…? 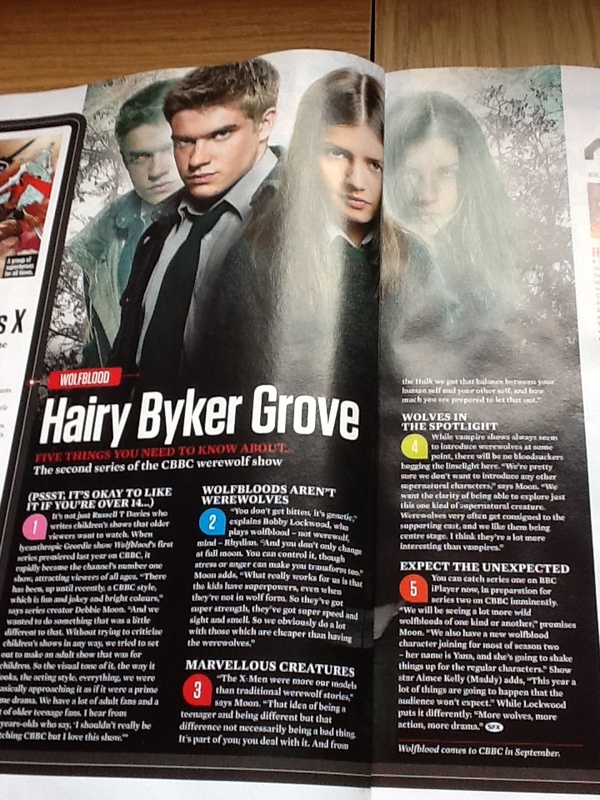 The new issue of SFX Magazine, out today (the one with Riddick on the front) has an article on Wolfblood! My work talked about in SFX? Lifetime ambition achieved! Now I just have to meet Chris Claremont, win a Hugo, and go into space, and that’s the whole list! Want to be one of the first people to see the first episode of season two of Wolfblood? Of course you do! And it’s only just occurred to me that this is not the sign of a bad movie – it’s the sign of a very good one. It’s the sign of a fully-realised story world, a universe that’s not a picture that only looks real from one angle, but a hologram that holds up from every angle of scrutiny.